How can a cloud network establish a secure connection with on-premise IT resources? Solutions and service compositions can be required to execute partially in the cloud and partially on-premise due to scaling requirements, compliance regulations or organizational policy, creating the need for secure connectivity. A virtual private network (VPN) is used to establish an encrypted connection between the cloud service provider and the cloud consumer. A VPN is established between the cloud consumer gateway (CCG) and the cloud provider’s virtual private gateway (VPG) using the Border Gateway Protocol (BGP). A secure connection is established between the cloud consumer network and virtual private cloud. A customer network securely connected to a VPC. 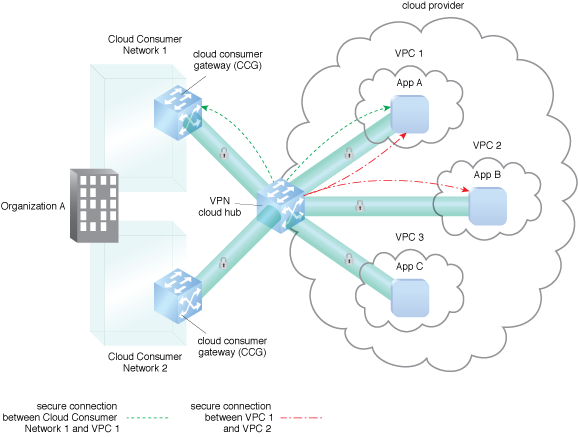 VPN connections are established via the use of a cloud hub.